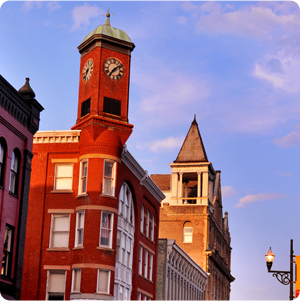 Downtown Staunton contains many examples of Virginia’s finest Victorian architecture. Some of the most notable can be seen in the Beverley Historic District, which was listed in the National Register of Historic Places in 1981. Most of the buildings in this area date from the 1870s to the 1920s. This historic district is small, and therefore perfect for exploring on foot. Park in the New Street Parking Garage ($1/hour) or in the Hardy lot on Market Street ($.50/hour). The Stonewall Jackson Hotel, 24 S. Market St., was built in 1924 in the Colonial Revival style and is recognized by the National Trust Historic Hotels of America. Designed by H.L. Stevens & Co. of New York, it lends some of that city’s height to Staunton and rings in as Staunton’s tallest building. The red, neon sign and original details like marble floors, chandeliers, and only known working Wurlitzer organ on the mezzanine were retained when the hotel underwent at $21.5 million dollar renovation and expansion in 2005. Peek inside the lobby and imagine the society women who used to gather around the fireplace in what is now the cocktail lounge. Though not an example of historic architecture, the American Shakespeare Center at 10 S Market St. is an important Staunton landmark. Built to resemble Shakespeare’s Blackfriars Theatre, a 14th-century monastery converted to Tudor theater, it produces Shakespeare’s plays as well as contemporary works. Cross Beverley Street and continue past the parking lot to see The Temple House of Israel at 15 N Market St. The one-story stucco Moorish Revival building was built in 1925 to house a growing congregation. Backtrack and head west on Beverley to see an example of a 1912 Renaissance Revival building at 125 E. Beverley St., originally the New Theatre, a lively venue for performances and silent films until a fire destroyed the interior in 1936. Note also on this block at 113 E. Beverley St. (1870), now Staunton’s General District Court, the site where the City Manager form of government originated in 1908. For a chance to take home your own bit of history, check out the treasures at 17 E. Beverley Antiques, which carries furniture, decor, and vintage art and clothing, and Black Swan Books and Music, which buys and sells rare and used books and records. Continue your tour by crossing New Street. This block contains examples of the Venetian Revival style at 19-21 E. Beverley (1911) and the Colonial Revival style at 7&9-15 E. Beverley St. (1899-1906). For an example of the Romanesque Revival style, look no further than the Marquis Building at 2-4 E. Beverly Street. Architect T.J. Collins not only designed the structure, notable for its corner entrance and stone columns, but housed his offices there as well. The Beverley Cigar Store can be found there now. The Camera Heritage Museum offers its own perspective on history and is worth a quick tour. Staunton Antiques Center deals in furniture, collectibles, and local, contemporary art, and Warehouse Collectibles and Antiques offers “two huge floors of anything old.” And if you’re feeling parched from all this history, The Split Banana will refresh you with 18 flavors gelato and sorbet with names like Almond Fig and Highland County Maple. Cross Augusta Street and enter one of Staunton’s most architecturally notable blocks. For a glimpse of the Beaux-Arts style, see the National Valley Bank at 12 – 14 W. Beverley St. (1903). Large oval stained glass skylight inside complement the ornate limestone exterior. The Gooch & Hoge Building at 15 – 23 W. Beverley St. (1880) is an example of the Italianate style and includes many fine details like lion’s heads. 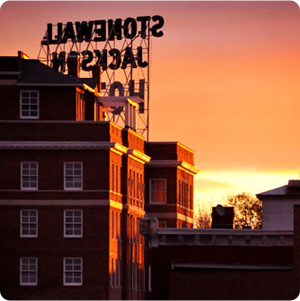 Two of Staunton’s most recognizable buildings also grace this block. The Masonic Temple at 7 – 13 W. Beverley St. (1896) is a perfect example of one of Staunton’s oldest buildings retaining its history as well as living a new live through its businesses. One of Staunton’s tallest buildings, it features a gable roof and mixes classical and medieval elements and is home to Baja Bean Co., The Split Banana, and H. L. Lang & Co. Jewelers. In 1916, T.J. Collins remodeled The Clocktower 27 – 29 W. Beverley St (1890). The first floor now houses the Clocktower Restaurant and Bar, Downtown 27 (a music and event space), and The Clock Tower Convenience Store, but it was originally the YMCA, notable for being only the second in Virginia. It contained a bowling alley, track, and gym. Many of the original components of the clock are still working today! This block features even more antiquing at Queen City Marketplace and the taproom at Shenandoah Valley Brewing Company. Cross Central Avenue to see another example of the Romanesque Revival style at 103 W. Beverley St. (1894), originally the showroom of the Putnam Organ Works. Head back toward Central Ave. and turn south. Your child side will enjoy the elevated sidewalk, mural of the painting workman, and glimpse of Lewis Creek before it dips back underground. Turn left on Johnson St. and proceed one block to Augusta Street. The Augusta County Courthouse at 1 E Johnson St. (1901) was built by T.J. Collins in the Beaux Arts style, and is actually the fifth courthouse on this site, dating back to a 1755 log structure. The smaller structures flanking the courthouse along Barristers Row (pre-1870) have always housed law offices, but used to have a more eclectic demographic, consisting of restaurants, bars, cobblers, and barbers. A fun play on the location is the Crack the Code Escape Room, where visitors can choose from several themed rooms and work together to escape in one hour. Those enjoying old, used, and rare books should check out Barrister Books. End your tour by turning back onto New Street, making sure to note 20 – 22 S. New St. (1894), home to the R. R. Smith Center for History & Art. 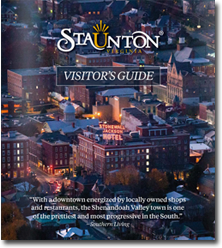 The Staunton Augusta Art Center, the Augusta County Historical Society, and Historic Staunton Foundation all operate in the recently restored, French Second Empire-style, T.J. Collins-designed Eakleton Hotel. Notable features of the building are the mansard roof, iron balconies, and decorative brickwork. One of Staunton’s oldest commercial buildings can be found at 3 – 7 S. New St. (1830). Cranberry’s Grocery & Eatery is housed in one of Staunton’s oldest commercial buildings. In the past, the structure has been a laundry facility, taxi garage, print shop, and tailor’s studio. The brick was a modern addition during the Victorian Era, but you can still see the original stone on the side walls. 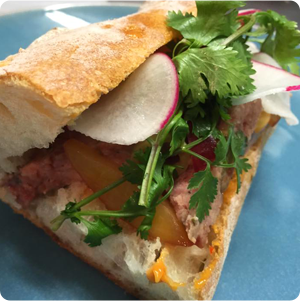 Wrap up your tour with something delicious to eat!